Mahindra & Mahindra Ltd. started its operations in India in 1945 and now serves a large customer base with their automotive needs across all the continents. Why is it Important to Insure Your Mahindra Cars? As per the Motor Vehicles Act of India, it is mandatory for every car owner to avail at least a third-party insurance. Having a car insurance also protects you against any unforeseen liabilities as a result of road mishap. A comprehensive car insurance policy covers the third-party liabilities as well as own damage liabilities that you incur due to the mishap. A third-party car insurance policy covers only third-party liabilities that you incur due to a mishap. You can buy a car insurance or renew your existing one via the insurer’s official website or any of the third-party insurance websites. You can also avail a car insurance or renew your soon-to-expire car insurance policy by visiting the nearest branch office of the insurer or meeting with an insurance agent. Inform the insurer as soon as the mishap takes place and raise a claim request. The insurer will send an authorised surveyor to inspect the vehicle and assess the total loss/damage incurred. Submit the originals and copies of the relevant documents to the surveyor. Take your car to the nearest authorised garage in case of cashless claim and get it repaired. The insurer will pay the garage directly for the repairs. Take your car to the nearest garage in case of reimbursement claim and get it repaired. You will have to pay the garage for the repairs and submit the payment receipt to the insurer for verification, after which you will be reimbursed with the amount you spent on the repairs. 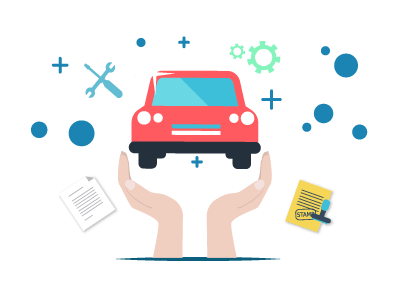 What is the validity of a car insurance? A car insurance is valid for 1 year. A compulsory excess is a part of the insured amount that is fixed by the insurer and mandatory for you to pay at the time of claim settlement. An Insurance Certificate is the original insurance policy document that the insurer issues to the insured. IDV stands for Insured Declared Value and it is the maximum market value of the vehicle at any given point of time with respect to its age. Depreciation is the loss in the car’s value with respect to its age. Mahindra and Mahindra Ltd. which is a part of the Mahindra Group, valued at US $20.7 billion, announced that they have sold over 6 lakh vehicles in FY 2018-19 against 5 lakh vehicles in FY 2017-18. The total growth in sales from 2017-18 to 2018-19 stands at 11%. In the month of March 2019 alone, the company sold 62,952 vehicles. The domestic sales in the same month were about 10,000 more than the domestic sales in March 2018. The company saw growth in passenger vehicles, medium and heavy commercial vehicles, and exports. The growth was marginally less in terms of commercial vehicles. Rajan Wadhera, the President of the Automotive Sector said that the company is proud that they ended the year with a double-digit growth rate though there were certain obstacles in the automotive industries. The three new launches of the company helped push sales of the manufacturer. Mahindra and Mahindra, India’s leading car manufacturer is offering select models – XUV500, TUV300, Scorpio, and Marazzo on lease for 4 years of 5 years. The lease tenure depends on the model and the city in which the transaction is being made. The objective of the initiative is to allow customers own cars by paying a fixed amount on a monthly basis for a specific period of time without having to worry about insurance or maintenance. The company, after leasing out the car, will take care of expenses of the car such as accident damage, car insurance, roadside assistance, maintenance, and resale guarantee. The company offers the deal with a very low down-payment option or no down-payment at all. The customer can choose to upgrade the vehicle at any time during the tenure of the lease too. Once the lease period ends, the customer can either return the vehicle to the company or purchase it at a price decided upon earlier. Mahindra has partnered with ALD Automotive and Orix to take care of the leasing services. While one of the two companies will own the car, the vehicle will be registered under the name of the customer. This new lease programme has been started in New Delhi, Mumbai, Bangalore, Hyderabad, Pune, and Ahmedabad. It will soon be rolled out in 19 other Indian cities.